It has been a rough few days around the ole homestead. Although she’ll be OK, we spent most of the week at the hospital with one of the kids. Saturday morning rolled around and after a few neglected chores were done we decided to take the boat out. I needed some float time so knowing that we were babysitting the grand-dude at 1:00 and that we would have a little less than an hour to fish I hitched up the boat and we headed for Campbell Lake anyway. After an extended wait for the train in Burlington (apparently we live on the wrong side of the tracks…) we arrived at the lake just before 11:00. There were two other rigs ahead of us and many others already in the parking lot. The water was up a couple feet from last Saturday so the launch was a little challenging but with only a minor delay we were floating. Bassplayer17 was already on the water and after a quick visit we got to business. We ran two rods; one with one of my new flies, a black and red version with the other rod sporting a 2 ½’” gold Rapala. 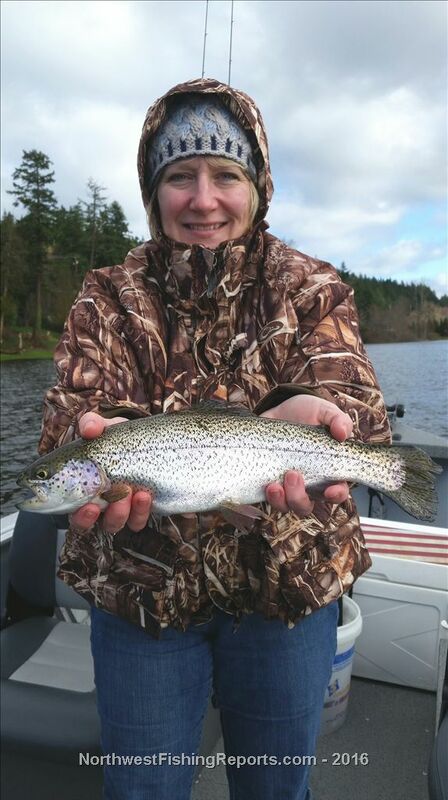 The Rapala went out first and before I had the second rod with the fly all the way out Karen springs out of her seat, grabs the rod with the Rapala and we are fish-on. 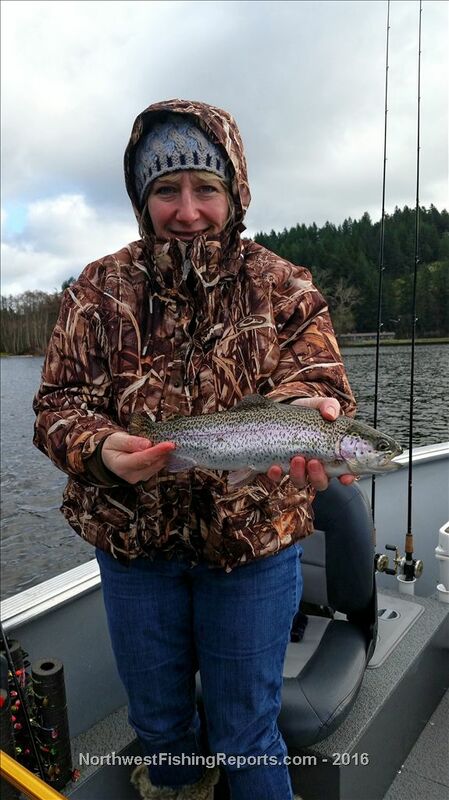 A nice rainbow ran her all around the boat before I could slide the net under her first fish of the day. From that point we had a number of drive-bys, a couple smaller but feisty 8” rainbows and a very nice fish we had to wrestle out of some submerged lily pads. Following our standard drill; we were trying to keep out trolling speed between 1.2-1.4 mph but with the wind we were trolling 1.0-2.0 mph. We ran both the Rapala and fly 60’ back on 6# fluorocarbon. We had steady action during our brief adventure and safely released everything that we caught. As much fun as we were having, our short-lived fishing trip had come to a close. We motored over to Bassplayer17’s boat, ogled his 5+ pounder, said goodbye and headed back to the launch. We had a great time and were back were home by 1:00 just in time for our afternoon/evening with the little guy. Great reports as usual Randy and great to see those big smiles!